I have been addicted to this CD for weeks so I figured I might as well review it and share it with you all. 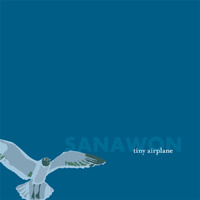 I was aware of Jenny Choi (the lead singer of Sanawon) because my lovely contributor, Anna Maria Stjarnell reviewed her CD, “Grand and Ashland” back in 2001. Her voice is very unique, almost girly but not in an annoying way at all. It’s really quite sweet and goes really well with the music. The songs are very well written pop tunes that will stick in your head for days. I have been singing, “I’m on this tiny airplane to you…” quietly under my breath for three days now. I just can’t seem to get enough of this record. If you like intelligently written pop-rock music please check this out. Oh and “Sanawon” is Korean for “fierce”. OK nice to see- interesting blogs are always sweet! Blessings.